Peroxide is a hazardous chemical, and potential contaminant in many foods, especially those that are spoiling or have been produced on freshly sterilized equipment. Exposure to peroxide can have harmful effects on the health, especially in vulnerable individuals such as children or the elderly. Stick-It Peroxide allows for rapid determination of peroxides in food solutions and liquids. These simple capillaries allow for determining the presence of peroxide in minutes, giving sensitive individuals protection even when away from their own kitchen. Remove the two provided strips from their container. Dip the first test strip in clean water. Dip the second test strip in the test solution. 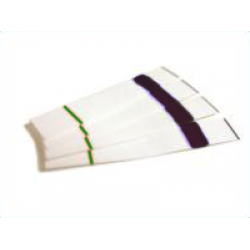 If no blue color forms on the test solution strip, there are peroxides in the food or drink. Detailed Instructions are provided with each order.